'Game of Thrones' season 8: What has happened so far? The upcoming six episodes will cost HBO around $90 million (15 million per episode). "Game of Thrones" season 7 left the fans with a number of questions and a lot of expectations for season eight. Fans have already started speculating what may be in store for them in season 8. Express recently reported that the final season won’t release until 2019. 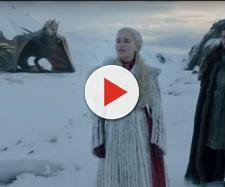 Earlier, HBO announced that the final series would only be featuring six episodes as opposed to the usual ten which left many fans rather disappointed. According to Daily Beast, the upcoming six episodes will cost HBO around $90 million ($15 million per episode). Recently, as reported by the Daily Telegraph, actor Liam Cunningham, who plays Ser Davos Seaworthy, revealed that the episodes featured in this season would be longer than those in the previous ones. He further added that since the storylines will now be the same, there will no longer be two filming units, thereby adding to the shoot length. In addition, John Bradwell (Samwell Tarly) had already said that each episode would be one to remember as a finale episode in itself. The final season production started on October 8, according to Liam Cunningham. He did reaffirm that it would take the unit a long time to shoot and that they would only be releasing the last season by early 2019, making this the longest break between seasons. Recently, the cast of the show was spotted in Ireland. As if that weren’t already too much for fans to bear, recently Kit Harrington (Jon Snow), appeared on "The Jonathan Ross Show" and added that shooting could be delayed a bit due to his wedding with former co-star Rose Leslie. “I rang [the producer] up and I said, ‘I’m getting married and it’s your fault actually,” he said on the show. He’s asked them to shut down production for the day of his wedding. He has reportedly told the producers to factor this in while arranging the shoot schedules so that all those from the "Game of Thrones" family could be there. Details of the big day have yet to be announced. Leslie and Harrington met during the second season, where she played the character of Ygritte, who was later killed. Their impending wedding has fans all agog. Though fans will have to wait longer for the actual season to release, there is solace in knowing that a wedding may be around the corner. The show's spin-off is also expected to come soon but the exact date is not confirmed. Many prominent characters might die in the last season.